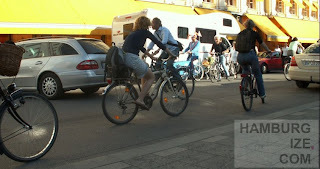 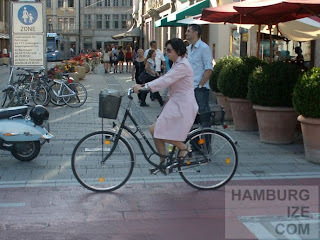 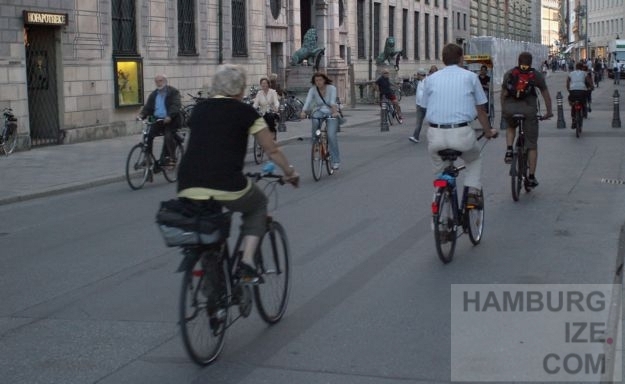 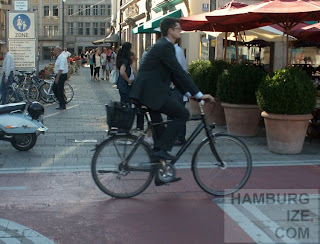 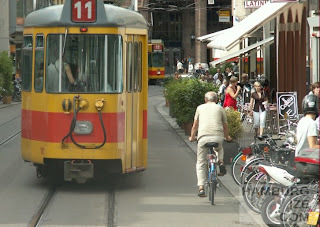 "Radlhauptstadt" - capital of cycling, the title of Munich´s campaign to push cycle traffic in the Bavarian metropolis. 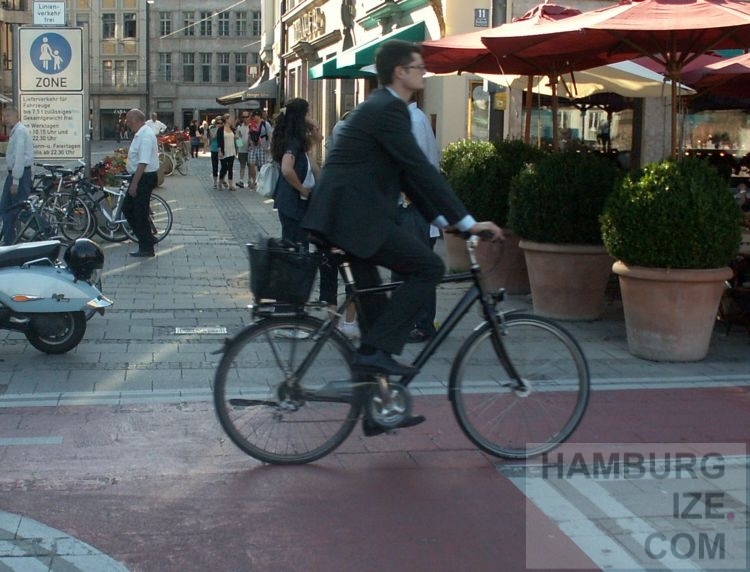 With the campaign Munich challenges Hamburg in the ranking of best German cycle city among the cities with more than a million inhabitants. 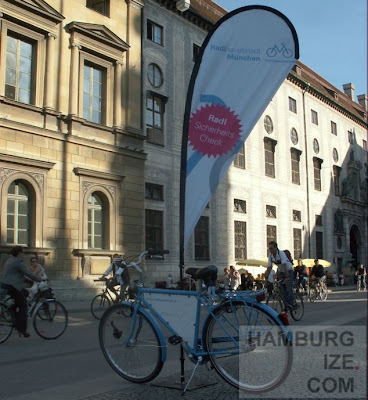 Hamburg promised to make it´s own campaign in the bicycle strategy for Hamburg (Radverkehrsstrategie für Hamburg) signed up in 2007. 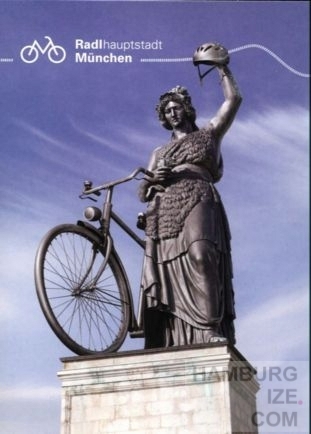 But half a year before being European Green Capital the promised campaign as a part of public relation for a better cycle climate is still missing. 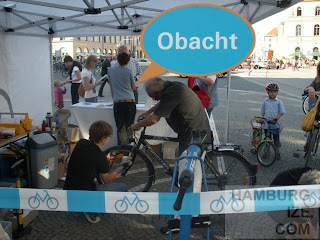 Free safety checks for bicycles are part of the Bavarian Radlhauptstadt campaign offered at hot spots of cycle traffic. 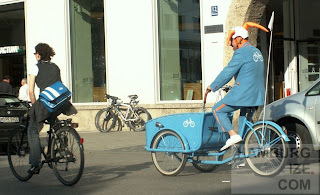 The safety joker sticks out dressed in a blue suit and with his blue cargo bike. 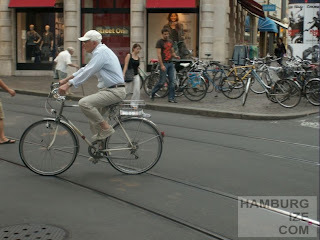 He tries to give attention for traffic safety and cycling. This week cycles could be checked at Odeonsplatz at Residenzstraße, Munich´s main cycle street with 15.000 cyclists per day, more cyclists than at any street in Hamburg. With the portion of cyclists of 14% at the time Munich tops Hamburg, where only 12.5 % take a cycle. 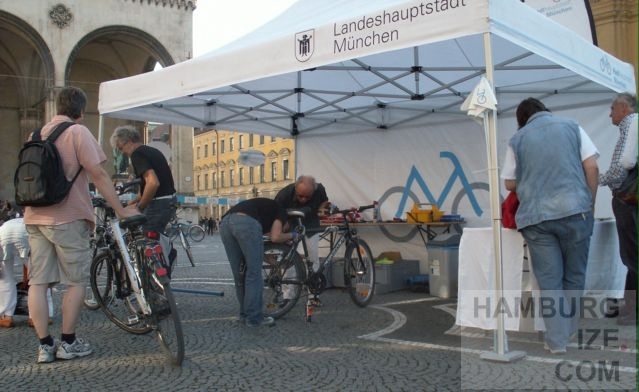 Munich is ahead not only in promotion and number of cyclists. 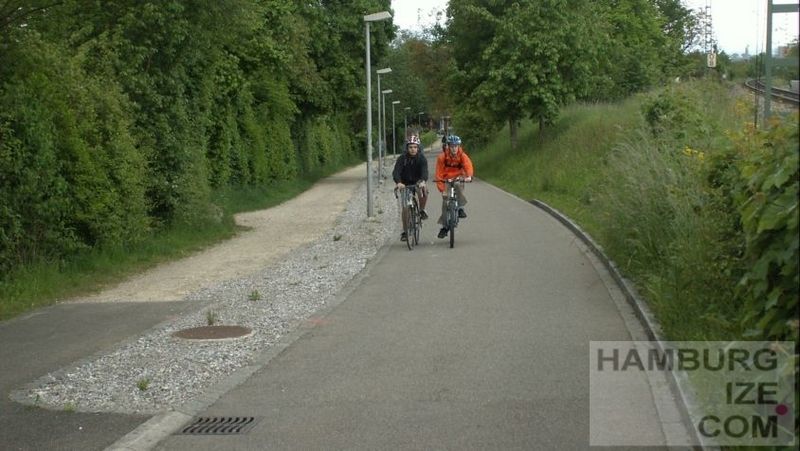 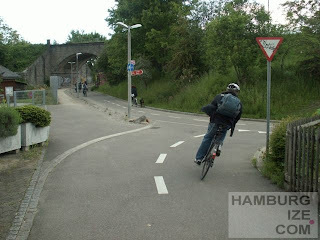 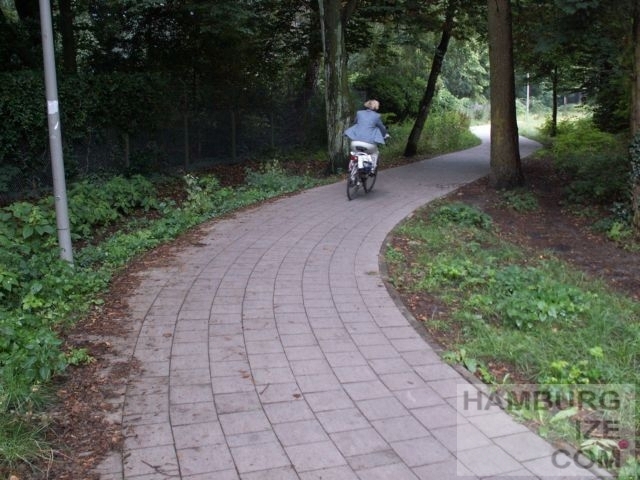 New cycle tracks are much wider and more comfortable than those in Hamburg. 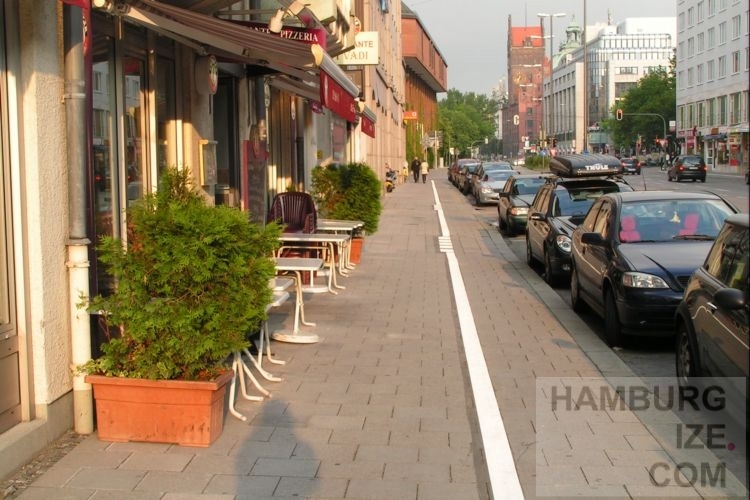 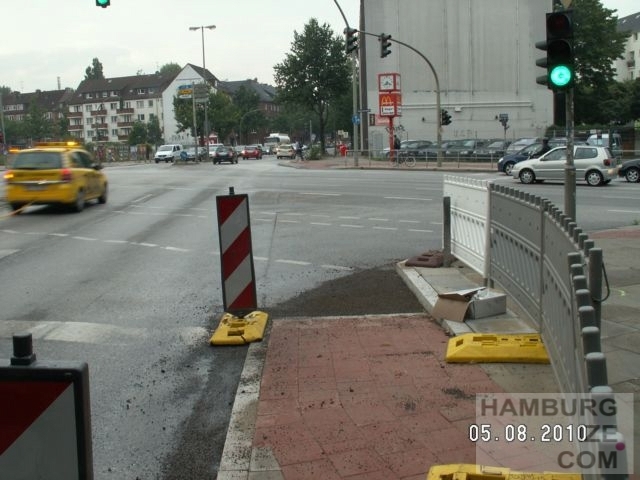 After redesign of cycle track in Stresemannstraße Hamburg uses new kind of protection against parking on cycle tracks. 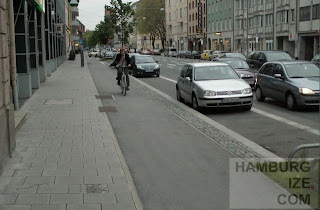 Parking on cycle tracks or cycle lanes is very common in Hamburg, however, and contrary to other countries Hamburg had allowed parking on many sidewalks or even on cycle tracks. Car drives have to watch out for a little traffic sign that indicates legal parking on sidewalks or cycle tracks. Protection was disputed by cycle lobbyists, authorities and politicians. 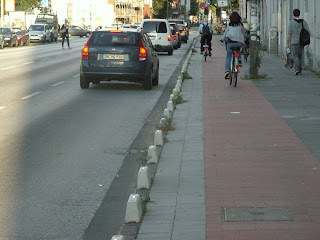 But without any controls of wrong parking on cycle tracks car drivers feel invited to misuse cycle tracks and lanes. 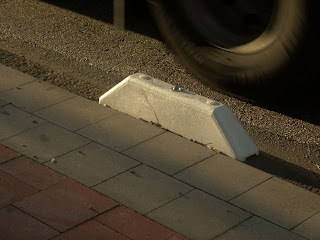 The new protection element is very small and does not damage cityscape like traditional fences or bars. 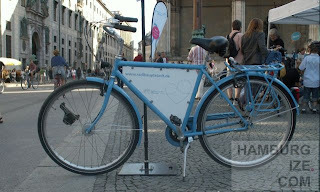 Now the new elements are going to be tested for durability. 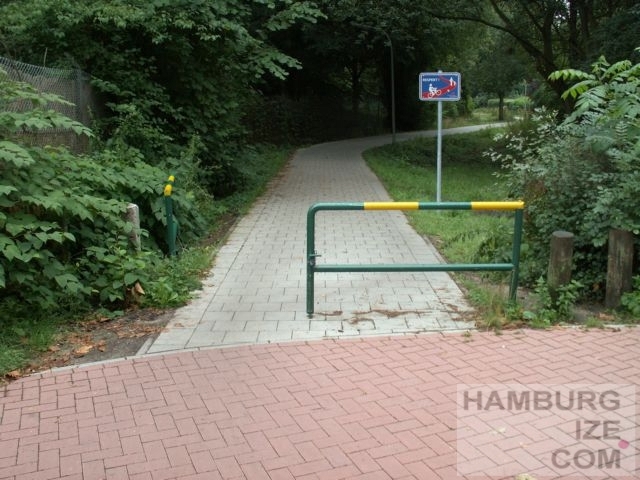 With the redesign cyclists lost the chance to lock their cycles at the former fences. Now the administration should look for an alternative of safe cycle parking. 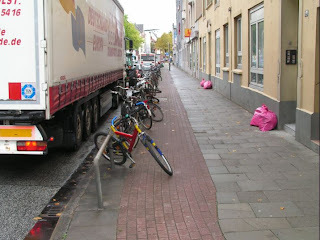 Stresemannstraße some years ago with cycles parking on the cycle tracks. 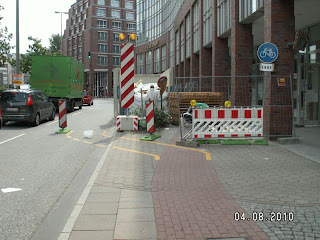 Stresemannstraße, cycle tracks under construction. The new cycle track, finished. 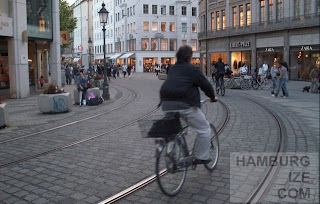 An intersection in Basel. 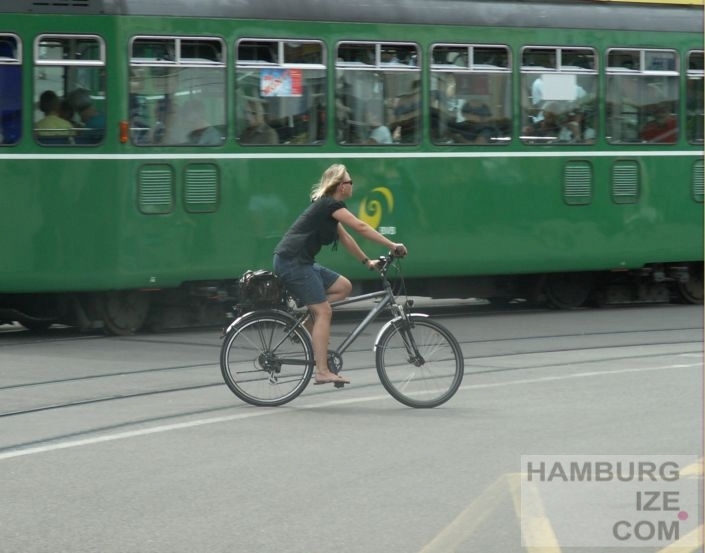 Watch the cyclists in mixed traffic with trams, cars and motorcycles and pedestrians. Five streets hit at the intersection. Zebra crossings are around the whole intersection and give pedestrians easy chance to get along. For cyclists it seems to be quite normal to move with cars at the intersection and turn to the left directly. The intersection has no signals. 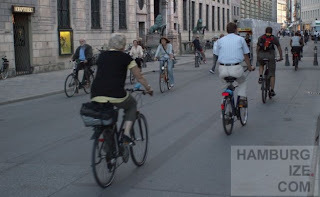 Everybody has to watch out and reduce speed. It looks absolutely easy. 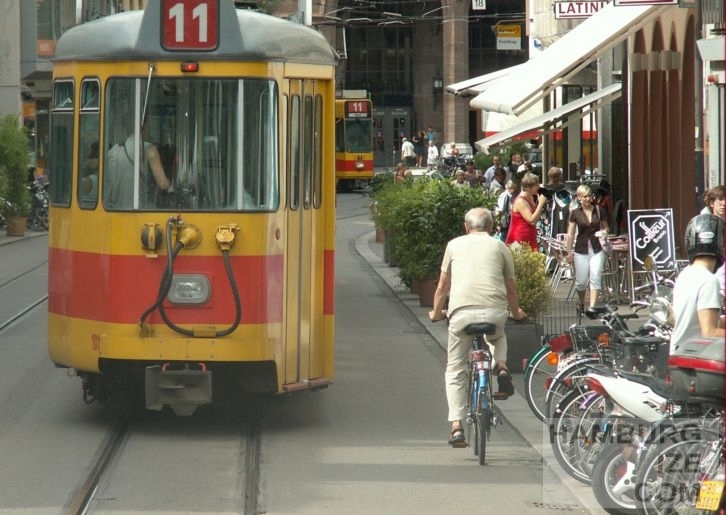 Vehicular Cycling from Stefan Warda on Vimeo. A new traffic sign has been invented in Hamburg. Respect! 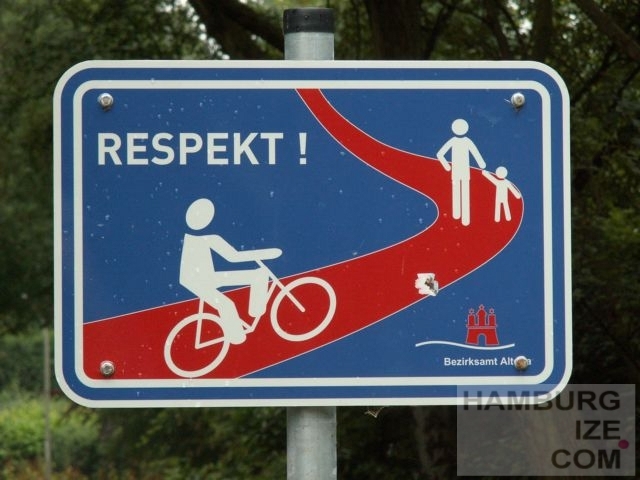 A local newspaper critized the new sign, because there were still too many signs. 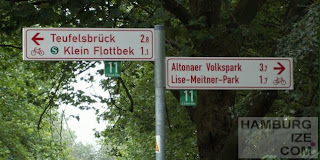 And hundreds of Euros must have been spend for creating and installing these new and useless signs. 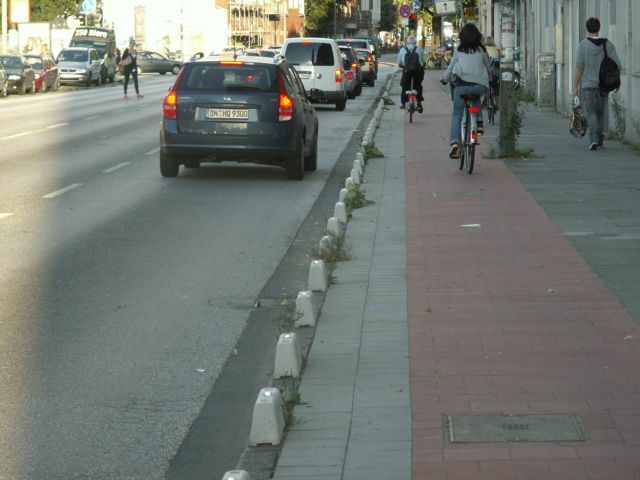 As reported cyclists should take more care about pedestrians on the green cycle route, that is used by cyclists and pedestrians. 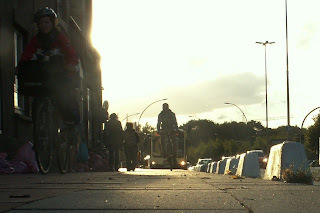 Accidents shouldn´t have been reported, but many complaints. 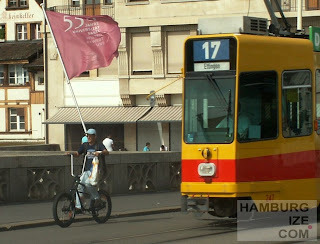 But what´s the problem? 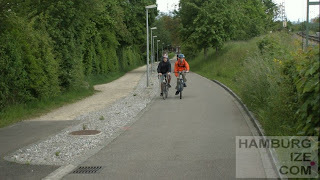 The green cycle route connects a rapid transit station with a residential area and an international school. 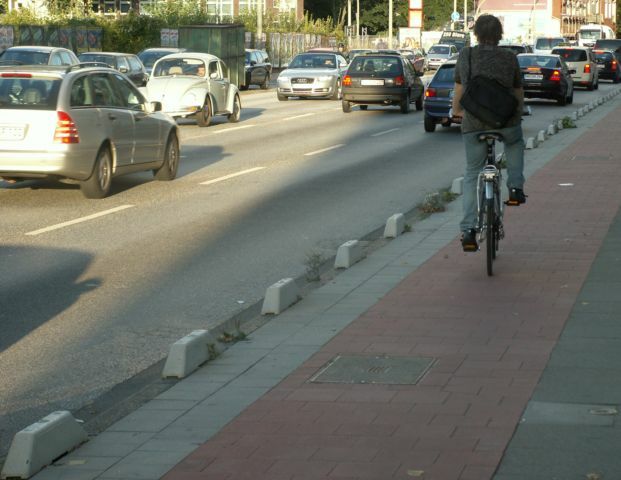 During rush hours there could be lots of cyclists going to work or to school. 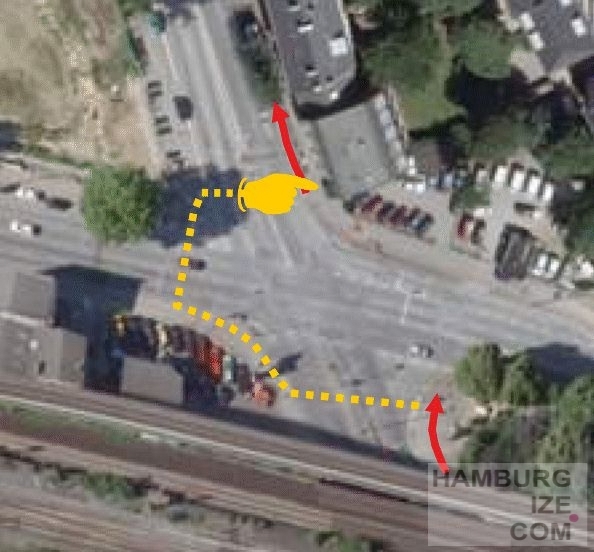 The route is layouted without seperation, and it goes down a light slope. A seperation between cyclists and pedestrians and appropriate space could have helped avoiding conflicts. 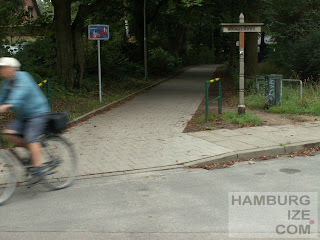 For the friends of the European Green Capital Contest here a little video promoting Hamburg to become the star in 2011. Cars as bursting soap bubbles are really fun. Direct way across the street under construction in 2010. 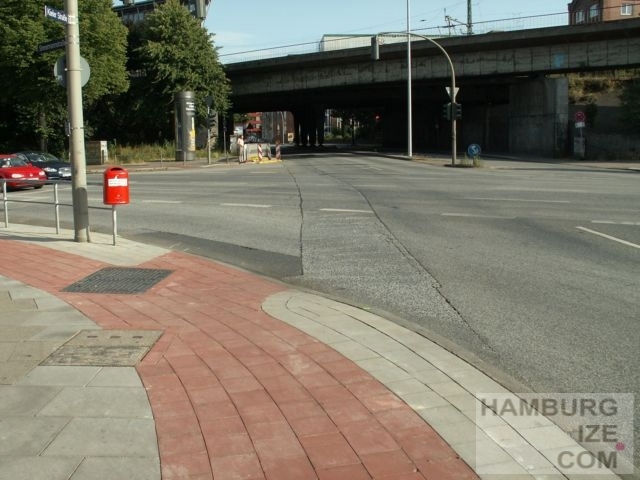 Some weeks ago Hamburg started undoing former planning mistakes. 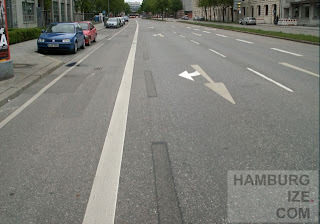 At a crossing of two major roads (Holstenstraße / Stresemannstraße / Kieler Straße) a direct way for cyclists was missing. 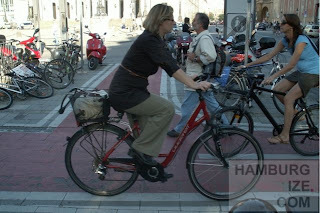 Cyclists should get off the bike and push it left around the crossing like a pedestrian. Many situations like this still exist in Hamburg and are waiting to be revised until 2011, when Hamburg will be European Green Capital. 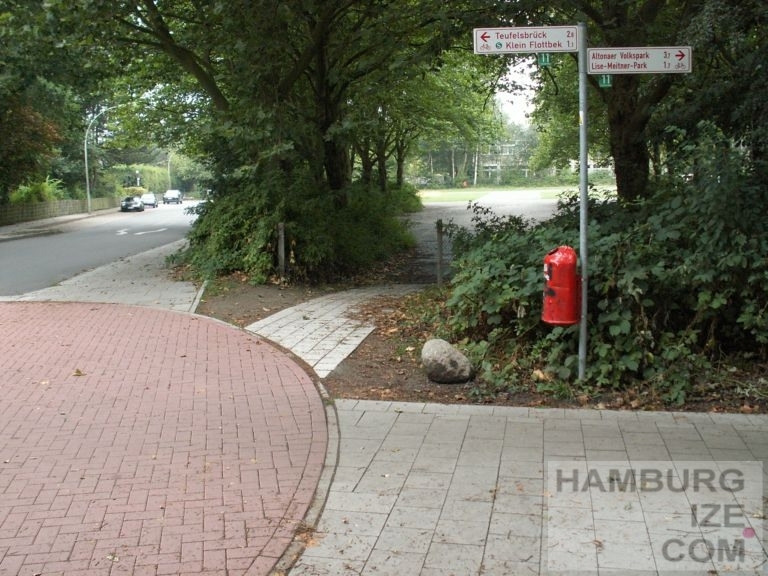 Vor einigen Wochen begann Hamburg den Rückbau früherer Planungsfehler. 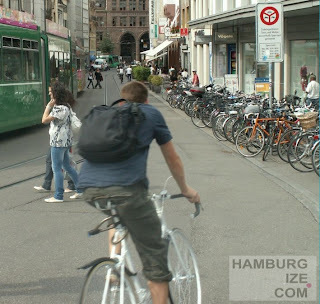 An einer Hauptstraßenkreuzung (Holstenstraße / Stresemannstraße / Kieler Straße) fehlte bislang eine direkte Radverkehrsführung. 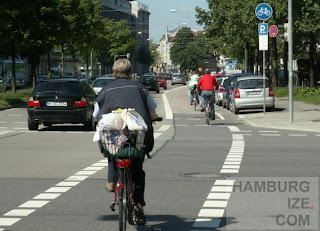 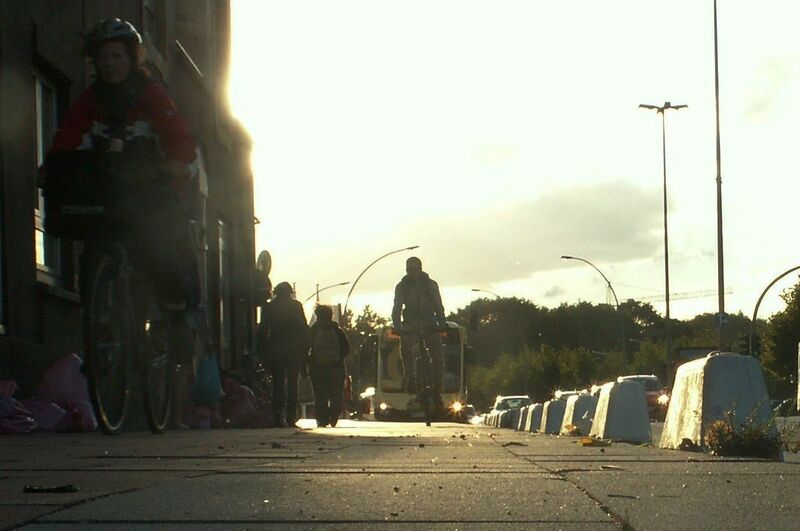 Aus Sicht der Straßenverkehrsbehörde sollten Radfahrer bislang absteigen und wie Fußgänger links herum um die Kreuzung laufen und das Rad schieben. Viele weitere gleichartige Kreuzungssituationen gibt es in Hamburg und warten darauf bis 2011, wenn Hamburg "Umwelthauptstadt" sein wird, umgebaut zu werden. 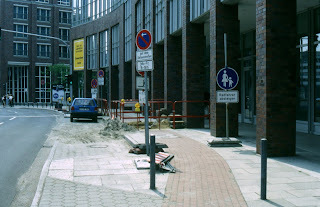 Same location some years ago. Die vorhandenen benutzungspflichtigen Radwege sind rot dargestellt. Die gelbe Strichlinie stellt die Schiebestrecke dar, falls Radfahrer niht auf der Fahrbahn fahren wollten. 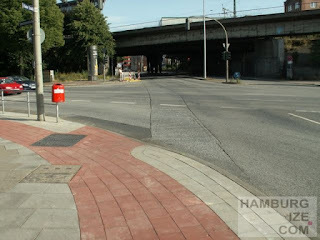 Hamburg in the year 2010. Cycle route 1 on the opposite side of the authority for building and traffic runs along a construction side. 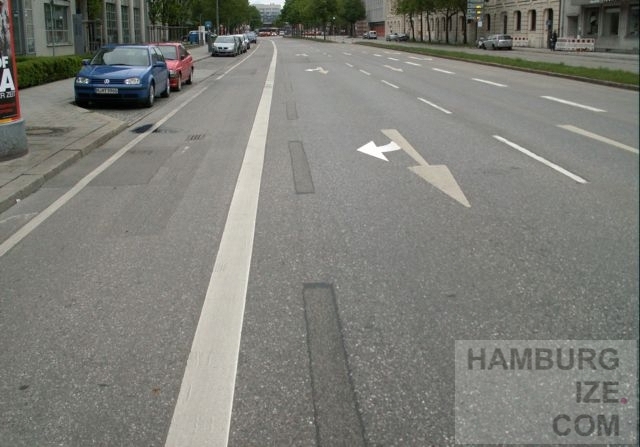 One road lane is closed, cycle traffic can switch onto the road lane. 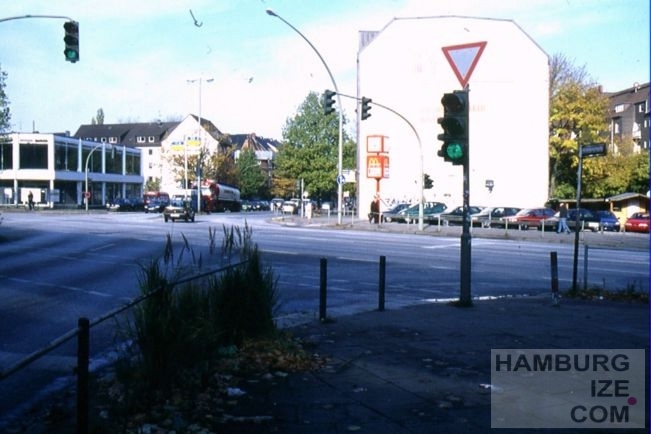 Hamburg in the year 1996. 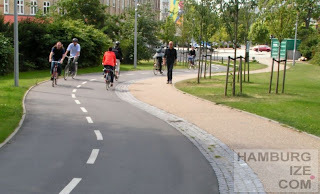 The cycle track opposite of the authority for building and traffic of the later cycle route 1 stops at a construction side. 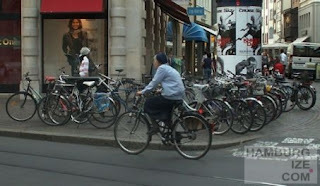 Cyclist get off ("Radfahrer absteigen")! Cyclist have to change into pedestrians and walk. 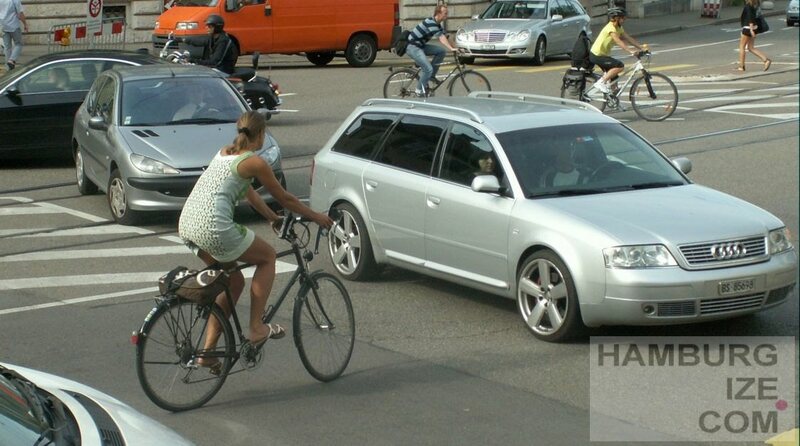 This perfect example is still the exception. We need more of this for Hamburg. 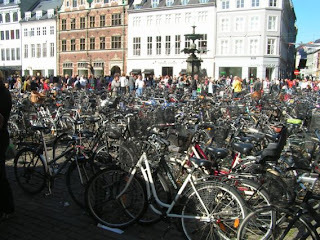 Copenhagen offers lots of space for cycle parking in the downtown area, and it´s all free. On the other side Copenhagen is listed under the 10 most expansive parking cities, among Abu Dhabi, Oslo, Tokyo, London, Sydney, Amsterdam, Vienna, Athens and Stockholm. The figures are taken from the 2010 Global Parking Survey, compiled by real estate research firm Colliers International, as Copenhagen Post reports. 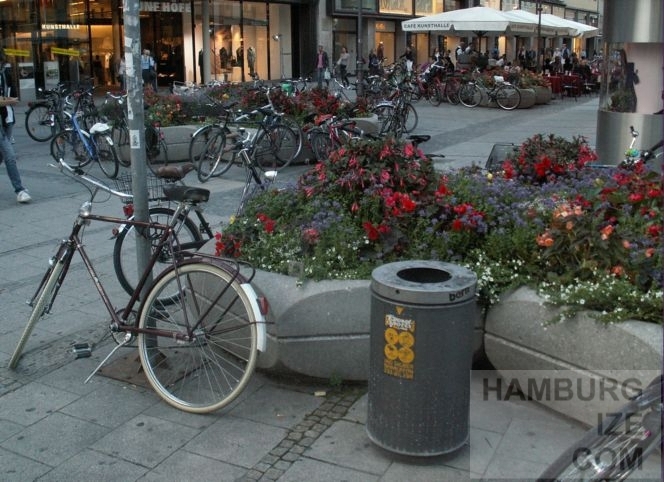 24h parking in the Danish capital is announced to be at 367 kroner per weekday. 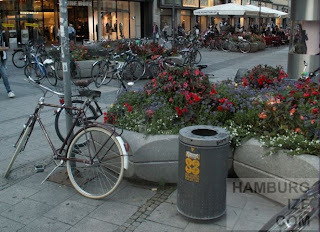 Free bicycle parking at Copenhagen´s Amagertorv. Take Amsterdam or Copenhagen as an example to make cycling into the city more attractive. 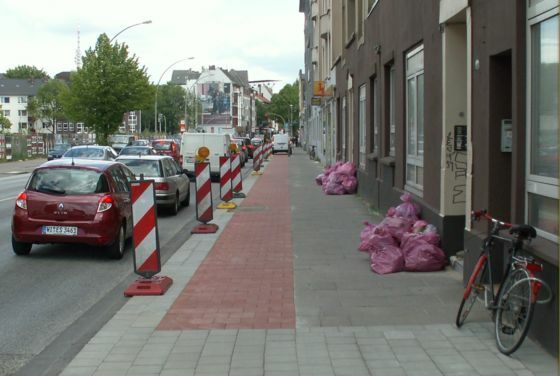 Why wasting precious urban space for parking cars?